Prime Minister Justin Trudeau called the SNC affair a "pretty serious difference of opinion" in a town hall in Thunder Bay. Justin Trudeau is unapologetic for the controversy that has cost him two cabinet ministers, a principal secretary, the Clerk of the Privy Council, and the opportunity to promote a federal budget that is his sales pitch to Canadians in an election year. 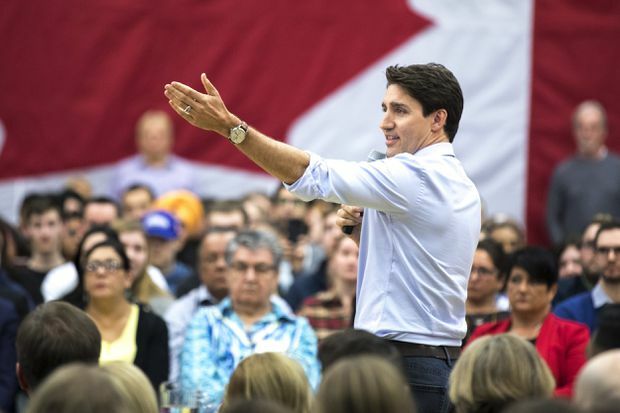 The Prime Minister told a town hall at a Lakehead University gym on Friday night that the SNC-Lavalin issue has been a “tough situation” that boils down to differences of opinion between himself and former attorney-general Jody Wilson-Raybould. But experiences like these, said Mr. Trudeau, have reinforced his ideas about what matters and what he wants to achieve as a politician. The Prime Minister was in this city to sell the federal budget released this week and to promote the job training benefits it contains. But the budget has taken a back seat to the SNC-Lavalin affair ever since The Globe and Mail reported on Feb. 7 that the Prime Minister’s Office pressured Ms. Wilson-Raybould to negotiate a deferred prosecution agreement without trial for SNC-Lavalin. Under such an agreement, the company would accept responsibility and relinquish benefits gained from wrongdoing, pay a fine and put in place compliance measures. Ms. Wilson-Raybould refused to approve the agreement and was shuffled from the justice portfolio in January. She subsequently resigned from cabinet. Jane Philpott – who resigned this month as Treasury Board president over the PM’s handling of the SNC controversy – urged the Prime Minister to waive all cabinet and solicitor-client privileges to permit Ms. Wilson-Raybould and other key players to speak freely about the fallout from the SNC-Lavalin criminal prosecution for bribery and fraud. Mr. Trudeau spoke for nearly two hours at the town hall in Thunder Bay and fielded questions on a wide variety of topics, from climate change to infrastructure, to the treatment of Indigenous people and the need for more mental health care. But early in the evening, he was asked two questions about the SNC-Lavalin affair. He responded by saying the disagreements with Ms. Raybould-Wilson came down to protecting the employment of Canadians, and that he believes between 9,000 and 10,000 SNC-Lavalin jobs could have been lost without a deferred prosecution agreement. This has become the focus of Parliament because it is a political issue in an election year, said Mr. Trudeau. But no laws were broken, the government waived privilege to allow Ms. Wilson-Raybould to give her side of the story, a Commons committee has studied the affair and there an investigation is being conducted by the Ethics Commissioner, he said. “This was a situation in which there was a pretty serious difference of opinion and perspective on the best way forward. And everyone involved was trying to do the right thing in terms of trying to make sure that we’re protecting good jobs and protecting workers right across the country at the same time that we’re respecting the rules of our institutions and respecting the independence of the rule of law,” said Mr. Trudeau.